The majority of meals are served family style, with counselors supervising at every table. We support and can accommodate ALL food allergies and special diets. We just need your help to understand how best to take care of your daughter. Peanut allergy?… NUT A PROBLEM! We have campers each year with dairy, nut, wheat, soy and egg allergies. Gluten free foods are also available, as well as vegetarian options. Picky eaters love camp with our main meal alternatives like our salad bar and pasta station. Every day, we have fresh fruit available at ALL times. We offer a healthy snack every afternoon during Canteen, and occasionally a tasty treat! At breakfast we offer a hot main meal, like pancakes, eggs, or french toast. Daily we offer hot and cold cereal, a yogurt, granola and fruit bar, as well as a bagel bar which includes bagels, toast, and muffins. 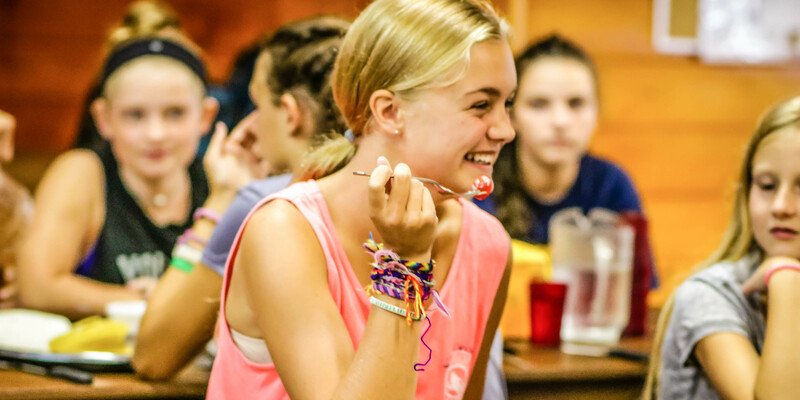 At lunch we offer a nutritious and substantial main meal for every camper. A main meal might be fresh chicken sandwiches , turkey wraps with all the fixings, chicken fingers and veggies, or home-made macaroni and cheese. At every lunch we also offer soup and a salad bar full of fresh and locally-sourced veggies, meats, toppings, and extras. Sandwiches are always available as well. We’re kind of famous for our Grilled Cheeses, so don’t be surprised if your daughter comes home asking you to make her one! At dinner we always offer a pasta bar and full salad bar, as well as a main course, like stir fry, chicken cordon bleu, our famous lasagna or roast turkey.